This morning we have three new saints! His Holiness canonized three new patrons, to pray for us in heaven. Actually, God makes saints, the Church discerns who the saints are. All three have strong connections to the Americas: Canada and Brazil. The Society must not refuse this invitation offered to present anew this versatile figure who is inspiring and extremely relevant to this day. What does the Lord want to say to us in giving us the gift, in less than a year, of Church recognition of the evangelical value of the lives of our two companions, Peter Faber and José de Anchieta? These are two men who accomplished missions so different and yet so similar in the Jesuit spirit that should animate our mission. Both, with the passion of their lives, invite us to discover that the “restoration,” more than being a mere historical event for us, ought to manifest the ever present “mode of being” of an apostolic body in continuous re-creation. José de Anchieta, “of medium height, lean, with a strong and decisive spirit, bronzed features, bluish eyes, ample forehead, large nose, thin beard, and with a happy and friendly face,” spent 44 years of his life traversing a good part of the geography of Brazil and carrying the good news of the Gospel to the native peoples. Read Father Adolfo Nicolás’ whole letter here. Saint Marie de l’Incarnation (Marie of the Incarnation) is an amazing Ursuline sister who founded the first Ursuline convent in Canada, founded Canada’s first school and is called “Mother of Canada.” The biography of Saint Marie is written by the Ursulines. Saint François de Laval, was the first bishop of Québec. You can read about him at Center Francois de Laval. In literature Saints Marie of the Incarnation and François de Laval are found in Willa Cather’s 1931 novel of early Quebec, Shadows on the Rock. May our three new heavenly companions to show us by their example how to love God in a particular way. Gathering for prayer was an opportunity for the Holy Father to gather with his religious community in Rome to give God thanks for the many blessings received, and to give thanks for the new Jesuit saint Peter Faber (Pierre Favre). Several bishops and priests concelebrated the Mass: Cardinal Angelo Amato (Saints); Cardinal Agostino Vallini (vicar general of Rome); Archbishop Luis Francisco Ladaria Ferrer, SJ (CDF secretary); Bishop Yves Boivineau of Annecy, France, in whose diocese Faber was born, and the vicar general Father Alain Fournier-Bidoz; and the Jesuit superior general Father Adolfo Nicolas, SJ, with seven younger Jesuit priests. Peter Faber was canonized and thereby added to the long list of Jesuit saints by Pope Francis on 17 December 2013. Faber was the first companion of Saint Ignatius of Loyola, the first priest of the Society and is known as “the second Jesuit.” Faber is also known for his competency in giving the Spiritual Exercises. The tombs of Saint Ignatius and Saint Peter Faber are located in the Church of Jesus. This is the second time since being elected the bishop of Rome that Francis has offered Mass with the Jesuits at the Jesus Church. We heard Saint Paul tell us: “Have this mind among yourselves, which was in Christ Jesus, who, though he was in the form of God, did not count equality with God a thing to be grasped, but emptied himself, taking the form of a servant” (Philippians 2:5-7). 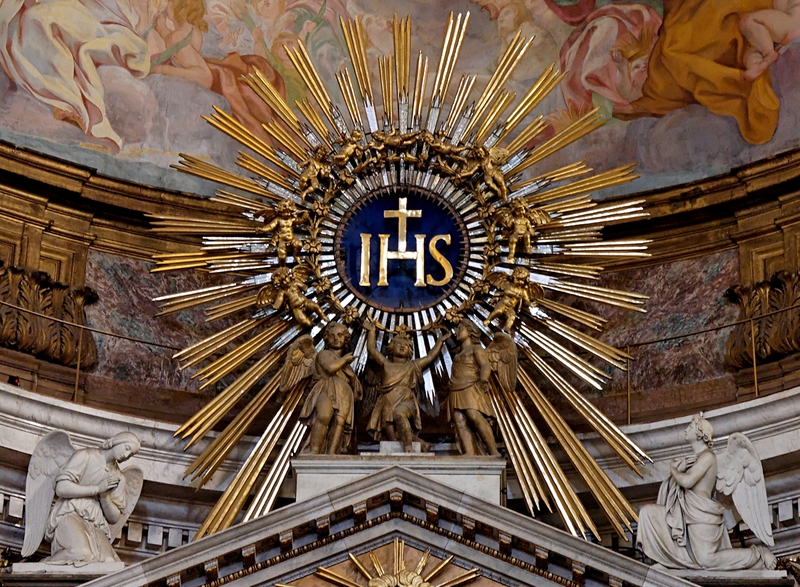 We, Jesuits, want to be conferred the name of Jesus, militate under the standard of his Cross, and this means: to have the same sentiments of Christ. It means to think like Him, love like Him, see like Him, walk like Him. It means to do what He did and with his same sentiments, with the sentiments of his Heart. The heart of Christ is the heart of a God who, out of love, “emptied” himself. Every one of us Jesuits who follow Jesus should be willing to empty himself. We are called to this abasement: to be of the “emptied.” To be men that do not live centered on themselves because the center of the Society is Christ and his Church. And God is the Deus semper maior, the God who always surprises us. And if the God of surprises is not at the center, the Society becomes disoriented. Because of this, to be a Jesuit means to be a person of incomplete thought, of open thought: because one always thinks looking at the horizon which is the ever greater glory of God, who ceaselessly surprises us. And this is the restlessness of our void, this holy and beautiful restlessness! However, because we are sinners, we can ask ourselves if our heart has kept the restlessness of the search or if, instead, it has atrophied; if our heart is always in tension: a heart that does not settle down, a heart that does not shut itself in on itself, but which beats the rhythm of a journey to undertake together with all the faithful people of God. It is necessary to seek God to find Him, and to find him in order to seek Him again and forever. Only this restlessness gives peace to the heart of a Jesuit, a restlessness that is also apostolic, which must not make us grow tired of proclaiming the Kerygma, of evangelizing with courage. It is the restlessness that prepares us to receive the gift of apostolic fruitfulness. Without restlessness we are sterile. This is the restlessness that Peter Favre [Faber] had, man of great desires, another Daniel. Favre was a “modest, sensible man of profound interior life and gifted with the gift of close relations of friendship with persons of all sorts” (Benedict XVI, Address to Jesuits, April 22, 2006). However, he was also a restless, uncertain and never satisfied spirit. Under the guidance of Saint Ignatius he learned to unite his restless but also gentle — I would say exquisite –, sensibility with the capacity to take decisions. He was a man of great desires; he took charge of his desires, he acknowledged them. In fact for Favre, it was precisely when difficult things were proposed that his true spirit was manifested which moved him to action (cf. Memoriale, 301). Authentic faith always implies a profound desire to change the world. Here is the question we should ask ourselves: do we also have great visions and dash? Are we also daring? Does our dream fly high? Does zeal devour us (cf. Psalm 69:10)? Or are we mediocre and content with our laboratory apostolic programs? Let us remember always: the strength of the Church does not lie in herself and in her organizational capacity, but is hidden in the profound waters of God. And these waters agitate our desires and desires enlarge the heart. It is what Saint Augustine says: pray to desire and desire to enlarge the heart. In fact it was in his desires that Favre could discern God’s voice. Without desires one goes nowhere and it is because of this that we must offer our desires to the Lord. Stated in the Constitutions is that “one’s neighbor his helped with desires presented to God our Lord” (Constitutions, 638). We are men in tension; we are also contradictory and inconsistent men, sinners, all. But men who want to walk under the gaze of Jesus. We are little, we are sinners, but we want to militate under the standard of the Cross of the Society conferred with the name of Jesus. We who are egoistic want, however, to live an agitated life of great desires. We renew now our oblation to the Eternal Lord of the universe so that with the help of his glorious Mother we may want, desire and live the sentiments of Christ who emptied himself. 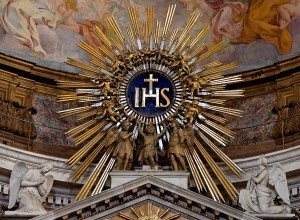 As Saint Peter Favre wrote, “We never seek in this life a name that is not connected with that of Jesus” (Memoriale, 205). And we pray to Our Lady to be messengers with her Son. A Vatican Radio report can be heard here. O God, who for the defense of the Catholic faith made the Priest Saint Peter Canisius strong in virtue and in learning, grant, through his intercession, that those who seek the truth may joyfully find you, their God, and that your faithful people may persevere in confessing you. Before he set out for Germany—he is rightly called the second apostle of that country—Saint Peter Canisius received the apostolic blessing, and underwent a profound spiritual experience. He describes it in these words. Eternal High Priest, you allowed me in your boundless goodness to commend the fruit and confirmation of that blessing to your apostles, to whom men go on pilgrimage to the Vatican and who there work wonders under your guidance. It was there that I experienced great consolation and the presence of your grace, offered to me through these great intercessors. They too gave their blessings, and confirmed the mission to Germany; they seemed to promise their good will to me as an apostle of that country. You know, Lord, how strongly and how often you committed Germany to my care on that very day: I was to continue to be solicitous for it thereafter, I was to desire to live and die for it. At length, it was as if you opened to me the heart in your most sacred body: I seemed to see it directly before my eyes. You told me to drink from this fountain, inviting me, that is, to draw the waters of my salvation from your wellsprings, my Savior. I was most eager that streams of faith, hope and love should flow into me from that source. I was thirsting for poverty, chastity, obedience. I asked to be made wholly clean by you, to be clothed by you, to be made resplendent by you. So, after daring to approach your most loving heart and to plunge my thirst in it, I received a promise from you of a garment made of three parts: these were to cover my soul in its nakedness, and to belong especially to my religious profession. They were peace, love and perseverance. Protected by this garment of salvation, I was confident that I would lack nothing but all would succeed and give you glory. Today, in a private audience, the Pope met with Angelo Cardinal Amato, SDB, Prefect of the Congregation for the Causes of Saints, in which he gave us a new saint. 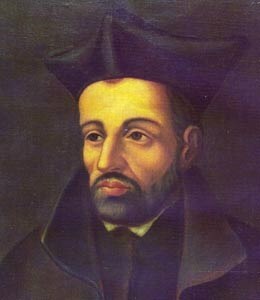 Peter Faber is keenly remembered by the Jesuits as being among the early companions of Saint Ignatius, and very proficient in giving Loyola’s Spiritual Exercises; he died in Rome on 1 August 1546. Equivalent canonization occurs when the pope, omitting the judicial process and the ceremonies, orders some servant of God to be venerated in the Universal Church; this happens when such a saint has been from a remote period the object of veneration, when his heroic virtues (or martyrdom) and miracles are related by reliable historians, and the fame of his miraculous intercession is uninterrupted. Many examples of such canonization are to be found in Benedict XIV; e.g. Saints Romuald, Norbert, Bruno, Peter Nolasco, Raymond Nonnatus, John of Matha, Felix of Valois, Queen Margaret of Scotland, King Stephen of Hungary, Wenceslaus Duke of Bohemia, and Gregory VII. Such instances afford a good proof of the caution with which the Roman Church proceeds in these equivalent canonizations. St. Romuald was not canonized until 439 years after his death, and the honour came to him sooner than to any of the others mentioned. We may add that this equivalent canonization consists usually in the ordering of an Office and Mass by the pope in honour of the saint, and that mere enrollment in the Roman Martyrology does not by any means imply this honour (Benedict XIV, l, c., xliii, no 14). It would be smart to remember that formula was used for the equivalent canonization of Saint Hildegard of Bingen by Pope Benedict XVI; he also declared her a Doctor of the Church. 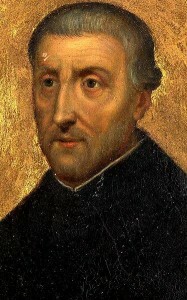 The holy Francis Xavier is recognized as one of the Church’s greatest missionaries. More than anything I see Xavier as a man with a great humanity who had an intense love for the Lord, His Church and for those given to him as friends. The Gospel only has a vitality if the minister reflects the tenderness of the Savior. It is the experience of the Lord’s gaze upon us that we can turn toward others. Hence, it was Xavier’s capacity to love and to work for his Lord that allowed him to be build the Body of Christ in Asia. We know the story. Xavier was born near Pamplona, Spain, in 1506, the youngest child in a large family. While attending to studies at the University of Paris he met Ignatius of Loyola, who gave him the Exercises. Sensing the call to serve the Lord in a different way, he joined other early companions who became the first members of the Company of Jesus (the Society of Jesus, aka, the Jesuits). Xavier was ordained a priest and missioned to be first missionary to the East — coast of India. Catholics were not doing well and things turned around with Xavier’s praying the Mass, the faithful administration of the sacraments, his preaching and teaching the faith. 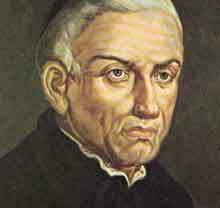 Xavier was renown for baptizing thousands. His missionary activity lasted for 11 years. Georg Schurhammer’s three-volume biography of Francis Xavier is a wonderful gift to read. The intensity of his love is remarkable.